More Black Lives Can Be Saved From This Serious Health Problem... If Only We Followed These 7 Simple Steps! 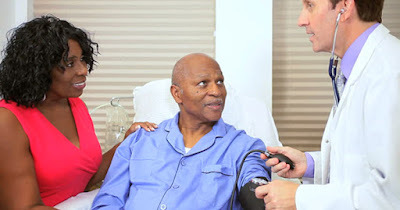 The American Heart Association (AHA) reports that 45 percent of Black men and 46 percent of Black women have high blood pressure, and are more likely to die from this serious health condition than their white counterparts. Uncontrolled high blood pressure often damages arteries and leads to heart disease and stroke. A recent study was conducted on 5,000 Black patients who initially were very neglectful of their health. However, after following even just 6 of the 7 steps recommended by the AHA, 90% of them showed improvement in their blood pressure levels. Even those who followed at least two of the healthy behaviors at the start of the study had a 20 percent lower risk of developing and dying from high blood pressure. During the study, which was published by Hypertension magazine, it was found that mostly women were the ones who lowered their blood pressures. In fact, all in all, those who followed the recommendations tended to be younger females. The study clearly showed that perhaps more education initiatives are needed to help men become more aware and active in controlling their blood pressure levels.